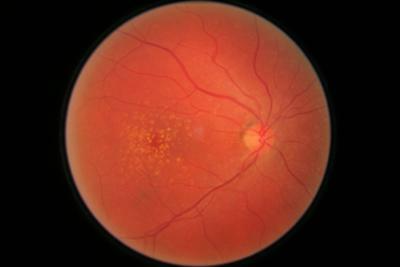 I was diagnosed with Dry AMD in February 2011. I have it in both eyes and it has progressed from a few small drusen to extensive drusen in 1 1/2 years. I have no family history of it, and do not have many factors that contribute to it. My ophthamologist is at a loss why it has progressed so rapidly. I saw a retina specialist, and he also has no explanation. They both tell me I am too young to have it progressed to this stage. I was also diagnosed with early cataracts at my last visit. I have been trying to "accept and adapt", but it's not easy. I have to smile reading some of your stories. I also have been in a frenzy the last year trying to accomplish all my projects I wanted to get done. I had to give up working 6 months ago because I was unable to read forms or work on computer for long periods. I don't drive at night, when it's raining, or on busy highways. 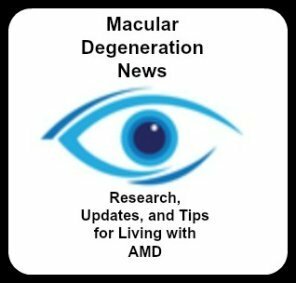 I've found that people don't understand dry macular degeneration because I am physically able to do many things, they just don't understand the frustration of trying to set the dial on your stove or thread a needle or try to read labels at the grocery store! My biggest question is how bad will my vision get and how long will it take? Since I was diagnosed at a younger age, what will my vision be like when I'm 60? In the meantime I am trying to adapt as well as I can. I use sunglasses or a hat when outside, and found that transition lenses really help on my prescription eyeglasses. I also use a magnifying lamp and increase the font on my computer. If anyone has any insight on what to expect in next 5 to 10 years, I would really appreciate it. I am a 38 year old female with dry macular degeneration. I was diagnosed with Lupus at 27 and it is in remission 8 years ago. I have Sjogren syndrome linked with Positive ANA Test in my body. Dry macular disease still in the same pattern since diagnosed 5 years ago. I believe that dry macular disease is an attack of my immunologic system. Diagnosed a year ago as a fluke on my first vision exam over a year ago. Saw several specialists since, all of which said not to worry, I am young and healthy and have no real risk factors, it likely won't even progress. Well, it is progressing. My vision is distorting in spots and I am starting to get worried. My income is crucial, I still have kids that need driving places. Hardly anyone knows about it because I don't want to stress out my family now as there are other very dire issues going on. I have had totally blind friends that lead happy lives, so I am trying to reassure myself that it will just take adaptation, but still!!! I am age 44 and 2 days ago was devastated to find myself diagnosed with dry macular degeneration in both eyes. My left eye vision is currently on but my right central vision is affected at the early stage. I was diagnosed with Dry Macular Degeneration over 10 years ago. I am 49 years old and an English teacher. I first noticed vision changes when moving from outdoors in bright light to indoors. My eyes progressively took longer and longer to adjust to indoor lighting. Then, I started noticing difficulty with colors at a distance. I talked with my optometrist and he examined my eyes. Noticing some small changes, he recommended that I see a specialist. Since then, I have been under the care of Dr. Ingrid Scott ( Awesome Doctor!) at the Hershey Medical Center. I have added exercise on a regular basis, increased greens in my diet, and take vitamins (AREDS formula) periodically. Until last year, my vision remained steady, and use of glasses and contacts gave me enough visual acuity. Unfortunately, I started noticing some other issues, blind spots . Consequently , it has been determined that I also have Glaucoma. Ugh! Not good for reading novels and correcting English papers. And so, I continue to fight off my vision, but one day, my only hope might be in bionics. I can still teach, but my time is limited--- I can see it. Just diagnosed with dry macular degeneration in both eyes at 43 with no family history and no precursors. I would love to talk to someone my age going through the same thing. Has anyone had blood work done and tested high or low calcium??? I would love to hear from you. I have the wet AND. I am 44 years old and wonder what my vision will be like. I am also in my 40s and diagnosed with dry AMD in both eyes. I think I have had it for quite a while before getting a diagnosis. I'm having lots of difficulties at work also. They have been very good about changing things for me but there is only so much you can do. I can't imagine a doctor telling you that you don't have to take the I-vites! Glad you didn't listen! I too, have just been diagnosed with macular degeneration and just turned 46. I do hope for slower progression then what you have just described. I was told by the retina specialist that I should not need to take the AREDS eye vitamins because of my age and that I probably am getting enough vitamins in my diet. That is one thing I think I will not follow the drs orders on. I do take eye supplements and am following a macular degeneration diet. I will definitely look up the bios of the two doctors you mentioned. You didn't mention if you are taking eye supplements! I'm assuming you are taking a good quality eye support product containing lutein, zeaxanthin, fish oil, bilberry, zinc, etc. There are some excellent formulations on the market created by naturopathic doctors. Don't forget to supplement while you are deciding which AMD clinics to visit. My opthamologist says that in 2013, new nutritional guidelines for AMD will be announced. A word of caution: Your total consumption of zinc should not exceed 50mg daily. Be sure your supplement contains 2mg of copper to offset the zinc. 3. Jonathan Wright's Tahoma Clinic in Washington State who is having excellent results with nutritional type therapies. Look these doctors up on the web. Their bios are impressive. I believe there is help for you!! Well, just went in for a typical eye exam. The picture of my right eye looked almost identical to the poster on the wall of macular degeneration. My left eye had a few spots but nowhere near as many as my right. I am in good health, good weight, excercise regularly, and eat well. There is no history of macular degeneration in either side of my family. Needless to say I am devastated. I have begun a vitamin and Omega 3 program but am not hopeful. Don't know what else I can do at this point. Open to any suggestions. Don't feel hopeful with my relatively early age. When I was 35 I was diagnosed with Dominant Drusen, a genetic form of macular degeneration. I’ve been seeing a doctor at Wilmer's Eye at Johns Hopkins since then (2005) and have been taking AREDS vitamins ever since. In 2016 she added a diagnosis of dry AMD, also in both eyes. My vision was stable until January of 2018, I began seeing wavy lines, distortion, black spots; many changes and very quick but only in my right eye. At my last visit, 10 days ago she noted loss of photoreceptors, some drusen regression and the same subretinal fluid she has been mentioning since January in my right eye. I sought another opinion at The Retina Group of Washington and they diagnosed my right eye with wet AMD. Now, at 48 yrs old, will have my first Eyelea injection on 6/22. Although I am scared to death, I am grateful that I did get another opinion and hopeful the injections will sustain my right eye and control any more vision loss. Greetings, I have had 20/20 vision forever then at age 38 I started getting blurry vision in my right eye. I am a software engineer so I dismissed the fatigue for ages as fatigue from staring at screens. After I turned 40. I went to a specialist and was diagnosed with macular degeneration. I am now 42 and my right eye has gotten worse, however, I still had 20/ vision in my left eye. Now I am afraid my left eye is having probs. I asked my doctor to focus on the left, however, as long as I have 20 vison in my left he ignores it and treats the right, even though I know the left is not right (and he has taking imagery). Should I try to force him to focus on the good eye? Dear Anonymous, Have you considered getting a second opinion from another retina specialist for confirmation, treatment recommendations and peace of mind? I am 45 and was diagnosed almost 10 years ago. I have been trying to find clinical trials, but it seems like almost all of them are a minimal age of 50. I have some good years where it progresses worse than others, so I can relate to your feeling of hopelessness. I have been unable to find a support group in my region, so any support you need, we are here for you. Thank you for the information on the two websites. I found the one very helpful. I have dry macular degeneration in both eyes with the left also affected with the wet. I did not even know about macular degeneration until I was diagnosed with wet macular degeneration at 49; 15 months ago. Good luck to all of you. Your advice is very good. Indeed it is so important to keep researching. You can either try to get involved in a clinical trial or talk to a retina specialist who is knowledgeable about what is soon to be available. Never give up hope. These two links came up with just a cursory glance at the Internet. You should look into them yourself, of course, and I believe there are other treatments on the horizon. Ask your doctor what he knows about programs and drugs like these. I think you also should look for every clinical trial that you can find. Clinicaltrials.gov is a good place to start, as well as the individual drug company's own websites. I have the wet (and a very agressive) form and have lost one eye already because no effective treatment was available. The other would be just as bad if left alone. I'm uninsured to boot. Fortunately, the clinical trial came along just a few months ago and has improved the condition. They're paying me to do it, too! I understand your mental condition, but eventually one should push that aside. This is what you should do: NEVER take for granted what a doctor tells you. I'll bet your doctor told you there is no treatment. Not true. There are trials available all over the country. Always be proactive. This is your body and your eyes. Don't let anyone make your decisions for you. I keep myself well armed with information. Feel free to find me by the name Barry Fivecoat on Facebook if you need further encouragement. I'd be honored to help if it's in my power to do so. I recently had an eye test and was referred to a local eye hospital where I had a eye scan. I was told that I have dry macular degeneration. I am in shock as there is no cure for this . All they told me to do was to take ICaps vitamins for my eyes and to eat plenty of foods high in lutein. Thanks for taking the time to write your story and for sharing how much the Macular Degeneration Society has helped you. They also offer support groups all over the UK providing support and practical help to people with macular degeneration. For those of you who live in the UK you can contact their Helpline on 0845 241 2041 or email help@maculardisease.org. I am 49 and currently legally blind (20/200) in my right eye due to chronic macular edema. I was a very high myope from birth (-12) in both eyes. I had Radial Keratotomy in 1980 on both eyes. My vision was improved to 20/30 uncorrected in both eyes, although I was negative in the right eye and plus in the left. I have enjoyed fairly good vision with normal age changes for 25 years. Two years ago, I rapidly lost my night vision and developed marked dry AMD in both eyes. Six months ago, my dry AMD in my right eye morphed to wet AMD suddenly. I have lost my fine detail vision and have no useful vision at all in my right eye. Since January 2010, I have had six Avastin injections, one steroid injection and one cold laser/Avastin treatment. The swelling improves for a day or two, then regresses back to no useful vision except for light and motion detection only. My retinal specialist states that it appears that my condition is from the congenital abnormalities of my eye structure and is probably irreversible. I am 20/40 (variable) corrected in my left eye, with mild cataracts and drusen, mild dry AMD. I am worried that my left eye will follow the sudden disease progression of my right eye and that I will be completely legally blind and lose my independence in the near future. So far, I have lost my ability to drive at night or in low visibility and must use some assistance tools to read. I cannot see faces across a room. Working on a computer or reading for any length of time is very difficult as I have focusing problems and get headaches. I was also diagnosed with several auto immune diseases last year and am taking aspirin, NSAIDS and an immuno-suppressant drug (Imuran). My doctors do not think there is a link between my UCTD (lupus like) and the sudden onset of my eye problems. However, it seems coincidental that the macular edema came on so suddenly 3 months after starting the "big gun" Imuran. I would like to receive feedback from other pathological myopia/wet AMD patients and Auto Immune disease patients who use immuno-suppressant drugs and have macular edema. I would also welcome any input from retinal specialists. I am age 44 with advanced dry AMD. No central vision in left eye which had steroid shot due to swelling and fluid in 2007 - which gave me restored vision. But 2008 I lost all central vision in my right eye by AMD. Left eye has some geographic atrophy- advanced AMD. I am on 3 immuno suppressants and my kidneys failed in 1997 from auto immune disease. Transplanted kidney was done in 2000. Retina specialist suspects my auto immune disease and blood flow issues are possible links to my AMD. I think you are on to something with the auto-immune link. When I was diagnosed with Hashimoto's (an autoimmune thyroid condition) that was when my eye problems started, too. I stumbled across a website that produces an aloe vera product (Digestaqure) that heals or helps a lengthy list of autoimmune problems by healing the small intestine. They claim that the small intestine becomes damaged and then nutrients cannot be absorbed and that that is the root of the problem with autoimmune diseases. It makes sense then that that is why supplementation helps your eyes--if your body is able to absorb and derive the benefit from the supplements. I went on the product 5 months ago and it has helped my digestive system immensely. I highly recommend checking out their site. I too wonder about the autoimmune link because my sister has an automimmune disease which I also have and one cousin has MS and another has chronic asthma and my father has psoriasis which I also have. My other sister has rhematoid arthritis. This is a cluster of autoimmune diseases. I wish I knew what the link was. Is it diet, environment such as exposure to triggers for an autoimmune response, or is it genetics or several factors of these factor. I myself am a healthy person with no other issues that are the result of diet, weight, stress or psychological issues. "I am only getting old"
During the last year I have spent quite a lot of time reading your stories and information on this webside and found lots of interesting bits. Sometimes I could relate to stories very well and wanted to answer but I found it very difficult to write something 'helpful'. Last year I (46)went to my optometrist because I lost my glasses at the beach, not because I had problems with my eyes. We did the usual eye test. After testing the same thing over and over again, he said that I refused to tell him all the numbers/letters on the board. I only saw 4 out of 5 signs. The middle was missing. After making more tests he told me that I had the first signs of dry macular degeneration and that there is nothing he can do. He kept repeating that it has something to do with healthy food. This surprised me a bit because I always thought I am cooking very healthy. I have children who constantly complain that they miss out on junk food and I have a partner with a health problem, which is the reason that I cook fat free and lots of vegetables etc. So I asked if I should go to a GP for a check up and the optomerist agreed to this, but also said I should google macular degeneration to get more information. I did suddenly realise that I couldn't see all the lines I was supposed to cut or sew. I did also remember that years ago letters of small prints started jumping in front of my eyes. (Back then my optomerist said, I just wasn't concentrating) and I also did get a bit impatient reading about people who are twice as old as me and getting blind.... sorry, but I thought, that is just not me. So I called the GP for a general health check. The results of a blood test were all 'very good' and 'no problem at all', so the doctor laughed at me. "you are only getting old, it is normal to have problems at your age". I asked her if she is pulling my leg and if she could refer me to a specialist, which she did. The specialist - who did not laugh - told me I am imagining things. "I know the signs of AMD and you certainly don't have this" is what he said. I told him what the optomerist said and asked him to check again. This second check seemed to change the doctors mind a bit and he said there might be a tiny problem, but nothing to worry about, sent me back to the GP, who is still smiling and telling me all about getting old. "We all use bits and pieces, some move slower, some use their eyesight, .... and you won't need that much sleep anymore, have you realised that?" Honestly, I would appreciate to sleep less and have more time to do things, but as things happen, I am usually tired very early in the evening after extremely busy days. And yes I had times when I was very stressed and spend more time in bed reading and eating chocolate than anything else. But this is now appr. 2 years ago. And I started bicycling regularly, running daily and looking after my health a bit more. So I did not agree with what the doctor said. Also, my eyes were still good enough to read on her computer what the specialist wrote to her, which was "Yes, there are signs of AMD, but due to her age treatment is not recommended" Does that mean, I am too old or too young for treatment? At this point I stopped to bother about doctors, started to rearrange my eating plan. I eat everything which is on the list 'anti infamatory' and added some pills to my menue (fish oil and vitamins) which are supposed to help with macular degeneration. I resigned my job because I spent most of the time comparing lines and not being able to sew straight anymore. I went to a school for a while and got to know a teacher who said, she knows about macular degeneration and she can help me with sewing. So we worked out together which bits of the material I could not see. I bought a brighter light which helps a lot. I also use magnetic sewing guides so that I don't have to look for lines and needles which I can't see, but pull the material alongside the magnets, which I can see. And although it is scary not to have 'proper medical support' all the people who wrote their story on this website and all the information Leslie delivered is helping a lot.